Zenvus Boundary maps farm, land or house perimeter boundaries, calculates the areas and populates the data onto Google Earth. From Zenvus portal, the surveys can be downloaded or printed. It supports cooperatives, governments and individual farmers, enabling these entities to have survey reports at a fraction of the typical cost of surveys. Property owners (farmers, landlords, home owners, etc) can do this without any external help. And when done, register with their cooperatives which help them ratify the boundaries with governments. We use this to formalize farmlands and properties, enabling financial inclusion like agro-lending, using farmlands as collateral. A farmer upon using Zenvus Boundary can download a PDF of the farm boundary report (sample here) in Zenvus account. The Zenvus Boundary also enables cooperatives or unions to have their logos and names emboldened in the reports for each member farm. 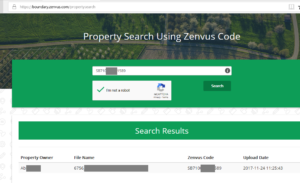 For public search of current Zenvus Boundary records, using the Zenvus Boundary Code of the report, click here (see sample picture below). Web manual (after using the mobile app, this explains how to download the report on Zenvus web app). If you download Zenvus Boundary app on Google Play, follow the screen instruction (register, login, etc. Please note the NIN as you need it to access the survey later). Click BEGIN PROPERTY to enter scan mode, put the property info, and click CAPTURE as you walk around the property perimeter. When you are back to the original position, click EXIT PROPERTY. That completes the data acquisition. Once that is done, click the SERVER TRANSFER mode when you have internet on the mobile device. If you are an individual property owner, put 0000 on the field code (agents/partners/enterprises, capturing many farmers at once, use the code we sent you). When transfer is done, it will say “…successful”. (Our algorithm will construct the survey with the data, superimposing on Google Map to deliver a survey which puts your property in visual relationship with other properties around.) Copy this link to your web browser https://boundary.zenvus.com/ ; your log Id and password are both the NIN you used for this property in the mobile app. System will ask you to create password and email. Inside you will see your survey to view and print. For Agents, the process is different as you would have access to all properties under your control, read the manuals. Zenvus Boundary maps property boundaries and superimposes them on Google Earth, providing stunning visualizations of properly locations and perimeters. The resulting maps or surveys can be printed from Zenvus web portal. Property owners (land, farm, and house) can do this without any external help. This video explains all. We have franchising opportunities across Africa for those interested in helping farmers, landlords, etc to digitize their property perimeters and locations..
NB: This solution has been used to support Zenvus farm sensors (focusing on governments and cooperatives at the moment) as we need farm boundaries to provide granular insights to farmers using Zenvus AI systems. Farmers with Zenvus hardware do not need the app, just put the sensor in boundary mode and walk round your farm; the map will be done.